Ryo was mono cutting test ranking. Kii province. Blade length : 71.4cm or 28.11inches. Sori : 1.25cm or 0.492 inches. Width at the hamachi :3.06 cm or 1.204 inches. Width at the Kissaki : 2.07 cm or 0. 85 inches. Kasane : 0.56cm or 0.22 inches. 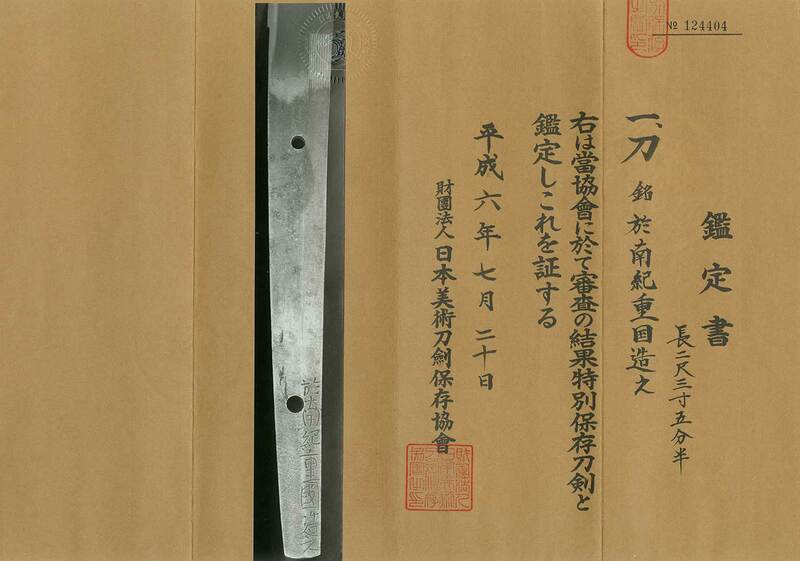 Shape : The blade is wode and thick with small Sori and longer kissaki. The blade is oo suriage mumei. and masame hada mixed with jinie and chikei work. with Ashi scatter in Ha and also Kinsuji. Special feature: First generation Nanki Shigekuni was called Kuro Saburo who worked at Yamato province with his father Kanekuni. They moved to Suruga province. He was worked for Tokugawa Ieyasu shogunate and moved to Kishu province. Tamahagane by supported Shogun Tokugawa. He was very skillful swordsmith Yamato den and soshu den also. This blade is Yamato Den style with nice Masame Hada. Saya : Dark brown Saya with some pattern inlay. Tsuba : Round shape Shakudo Nanako Tsuba, tiger and piony are engraved with gold color. Menuki : Shakudo, Shishi dog is engraved with gold color. Fuchikashira: Iron, wave design is engraved with silver cloth inlay. From Aoi Art: There are number of Suriage blade. As the reasons for that, the blades were so long. This Jigane and Hamon are very nice. This is a masterpiece of Nanki Shigekuni. Aoi Art estimation paper :NBTHK Tokubetsu hozon paper.